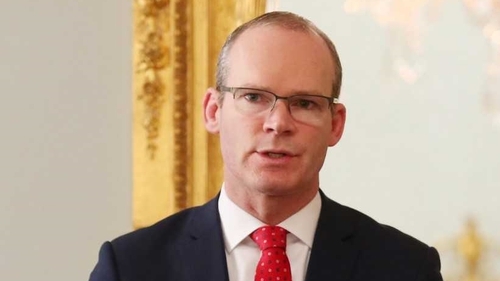 Minister for Foreign Affairs Simon Coveney has warned that if there is no clear legal language on the so-called "backstop" solution for the Irish border by the June EU summit then the entire Withdrawal Agreement governing Britain’s exit from the EU next March, including the transition deal, could be at risk. Mr Coveney was speaking following a meeting of EU foreign ministers in Luxembourg. Asked would the transition period be at risk if there is no agreement on the backstop in June, Mr Coveney said: "It puts at risk everything. "Michel Barnier has been very clear, and I have too - there will be no Withdrawal Agreement if there is not a backstop relating to the Irish border, consistent with Paragraph 49 [of the Joint Report agreed by the EU and UK] and the political commitments in December." The Tánaiste added: "The British government has committed to doing that. "If that is not in the Withdrawal Agreement then there will be no Withdrawal Agreement, and if there is no Withdrawal Agreement there will be no transition deal either." Paragraph 49 of the joint report states that Northern Ireland will effectively remain in the EU customs union if no other solution can be found to avoiding a hard border post-Brexit. When the commitments contained in Paragraph 49 were first translated into a draft legal text in February, British Prime Minister Theresa May vehemently rejected it, saying it would result in border checks along the Irish Sea, and that no British prime minister would ever support it. Since then, Mrs May has committed to negotiating a legal text based on the need for a backstop solution. There are ongoing negotiations between the British government and the EU on how that text will materialise. The Government said that the British government has not yet put forward any new, convincing alternative solutions to the backstop option. Mr Coveney said that the negotiations to date "have not delivered." He said: "June is a very important date from an Irish perspective. "We are, I think, putting down a marker which says that if there isn’t significant progress towards trying to find new wording that puts in place an operational backstop in the Withdrawal Treaty by June, then I think we’d have to ask some very serious questions as to whether it’s possible to do it by October - which is the end point when we are hoping to have a draft withdrawal Treaty in place." He added: "From my perspective, and this is shared by the Taoiseach as well, we want to see progress. "There’s a reason why Ireland asked for June to be the next date whereby heads of state of the European Union will measure progress and will review the EU [negotiating] guidelines in terms of how we proceed with negotiations and I think if there isn’t substantial progress on the Irish border issue in terms of a backstop, simply in line with what the British government has committed to by June, then I think there will be difficulties."